Along the Rio Grande in Texas, tiny insects are taking a big bite out of an invasive weed that competes for limited water resources vital to agriculture and native vegetation. 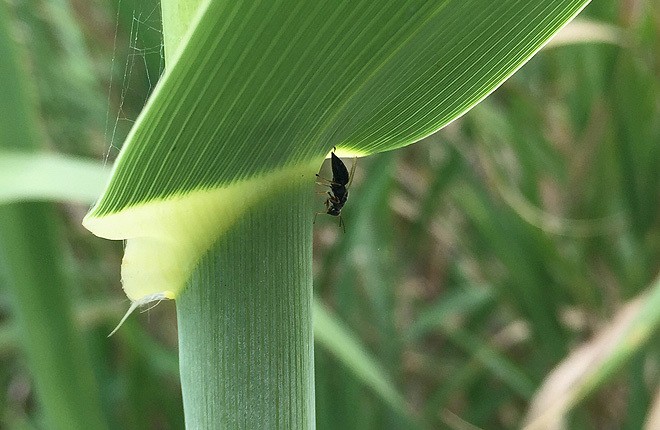 Several years ago, Agricultural Research Service (ARS) scientists released two insect species as part of a biocontrol program to kill giant reed (Arundo donax). The arundo gall wasp (Tetramesa romana) targets the main stem of the weed, while the arundo scale (Rhizaspidiotus donacis) attacks the plant's roots. Giant reed, also known as "carrizo cane" or "Spanish reed," forms dense thickets that clog streams and irrigation channels, weaken river banks, stifle native vegetation, affect flood control, and reduce wildlife habitat. This invasive weed can grow 3 to 7 inches a day, reaching heights of up to 30 feet. "The weed also creates an ideal habitat for cattle fever ticks and makes it more difficult for inspectors to detect tick-infested cattle and deer," says John Goolsby, an entomologist with the ARS Tick and Biting Fly Research Unit in Edinburg, Texas. Goolsby's recent research shows that the release of the insects has significantly helped control giant reed over more than 558 river miles between Del Rio and Brownsville, Texas. He and his team measured biomass-the amount of cane above ground-at 10 field sites before the insect release in 2007. At the same time, they measured sites where the insects were not released. Measurements taken in 2014 showed an average 22-percent decrease in plant biomass across the sites where the insects were released. "We've thinned the cane out significantly," Goolsby says. "The biggest decline in plants correlates with the greatest number of our biocontrol agents—the wasp and scale." The reduction of giant reed will save more than $4 million worth of agricultural water per year, he adds. Biocontrol of giant reed can also benefit Cattle Fever Tick Eradication Program efforts. To accelerate giant reed removal, scientists developed an integrated pest management approach that combines "topping," or cutting, the cane (mechanical control) with wasp releases (biological control). "Topping the cane suppresses growth for more than a year," Goolsby says. "It causes the plant to bush out like a shrub. We believe the insects love the bushed-out growth. Not only do the plants stay small in stature, but they are also more susceptible to attacks by the insects." The combination of topping and insect releases gives a high, long-term suppression of cane, Goolsby says. It allows native trees to grow and start shading giant reed. Additional impacts on giant reed are expected as wasp and scale populations increase, he says. Plans are under way to release a third biological agent, a fly that feeds on the weed's leaves. 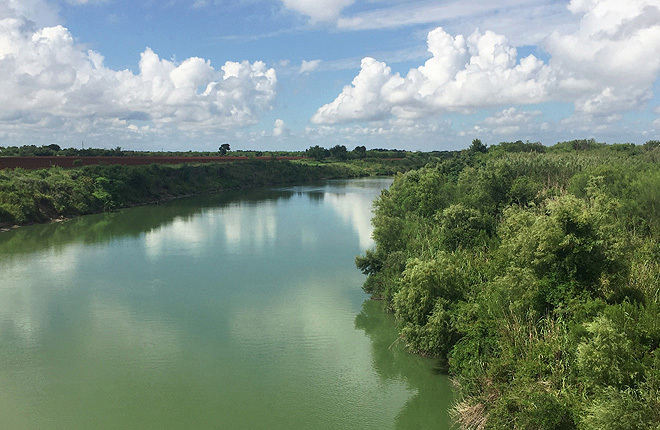 ARS's giant reed management project involves collaborations with Texas Agrilife, the University of Texas, the U.S. Customs and Border Protection, and Mexico's Comisión Internacional de Limites y Aguas and Instituto Mexicano de Tecnología del Aguas. This study was published in Biocontrol Science and Technology in 2015.—By Sandra Avant, ARS Office of Communications. 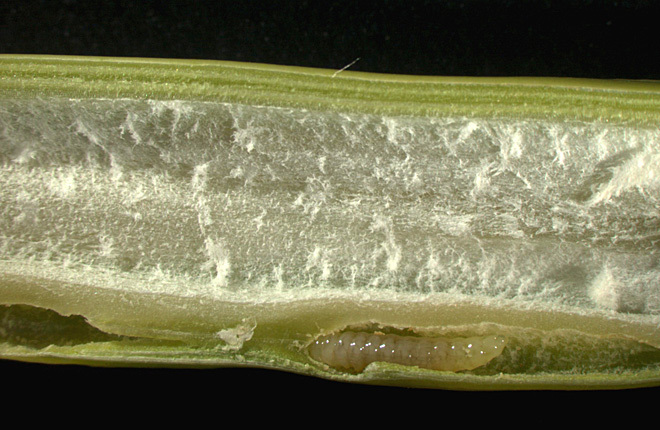 “Tiny Insects Take a Big Bite Out of Giant Reed” was published in the October 2016 issue of AgResearch Magazine. Wasp and scale insects effectively control giant reed. Cutting giant reed and releasing insects speeds the plant’s decline. Giant reed in ARS study decreased by more than 22 percent over 558 river miles. Giant reed biocontrol helps Cattle Fever Tick Eradication Program efforts.